Cranberries are more than a holiday favorite, given their remarkable nutritional and health benefits. A new research review published in the international journal Advances in Nutrition provides reasons why these tiny berries can be front and center and not just a side dish. The review authors conclude that cranberries provide unique bioactive compounds that may help reduce the incidence of certain infections, improve heart health and temper inflammation. Ten worldwide experts in cranberry and health research contributed to the article, including scientists and medical experts from Tufts University, Pennsylvania State University, Boston University, Rutgers University, French National Institute for Agricultural Research, University of East Anglia in the United Kingdom and Heinrich-Heine-University in Germany. The authors included more than 150 published research studies to create the most thorough and up-to-date review of the cranberry nutrition and human health research. "Hundreds of studies show that the bioactive compounds found in cranberries improve health," said lead author Jeffrey Blumberg, PhD, FASN, FACN, CNS, Director of the Antioxidants Research Laboratory and Professor in the Friedman School of Nutrition Science and Policy at Tufts University. "For example, the polyphenols found in cranberries have been shown to promote a healthy urinary tract and exert protective benefits for cardiovascular disease and other chronic conditions." Based on the totality of the published cranberry research, the authors concluded that the cranberry fruit is truly special because of the A-type proanthocyanidins (a polyphenol from the flavanol family), in contrast to the B-type proanthocyanidins present in most other types of berries and fruit. The A-type proanthocyanidins appear to provide the anti-adhesion benefits that help protect against urinary tract infections (UTI), which affect more than 15 million U.S. women each year. 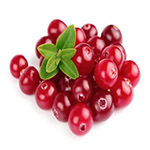 They present evidence suggesting that cranberries may also reduce the recurrence of UTIs - an important approach for relying less on antibiotic treatment for the condition. The authors also cite data that shows the cranberry may improve cardiovascular health by improving blood cholesterol levels and lowering blood pressure, inflammation and oxidative stress. Cranberries have been shown to help support endothelial function and reduce arterial stiffness. Together, these benefits may promote overall health and functioning of blood vessels to help slow the progression of atherogenesis and plaque formation, which can lead to heart attacks and stroke. While all fruit contributes necessary vitamins and minerals to the diet, berry fruits offer a particularly rich source of health-promoting polyphenols. Because of their tart taste and very low natural sugar content, sugar is often added to cranberry products for palatability. Even with added sugar, cranberry products typically have a comparable amount of sugar to other unsweetened fruit juices and dried fruit products. Additionally, the 2010 Dietary Guidelines for Americans asserts that the best use of calories from added sweeteners is for improving the palatability of nutrient-rich foods, as is the case when adding sugar to cranberries. As an additional option, non-nutritive sweeteners are used to produce low calorie versions of cranberry products. Americans can help increase their fruit intake by incorporating cranberries and cranberry products into their diet and there is no need to wait for the holidays - cranberries can be enjoyed year round - fresh, frozen, dried, or in a juice or sauce. "While we look forward to more research to better understand how cranberries affect our well-being and longevity, we know that including cranberries and cranberry products in a healthy diet is a great way to increase fruit intake," said Dr. Blumberg. The Cranberry Institute provided support for the research article. For more information about the Cranberry Institute, the health benefits of cranberries and current scientific research visit www.CranberryInstitute.org. The Cranberry Institute is a not-for-profit organization founded in 1951 to further the success of cranberry growers and the industry in the Americas through health, agricultural and environmental stewardship research as well as cranberry promotion and education. The Cranberry Institute is funded voluntarily by Supporting Members that handle, process, and sell cranberries. Supporting Members are represented in national and international regulatory matters and research efforts are done on their behalf.